It was time to create the base for which would be building our masterpiece. Everything starts with the floor and from there you build up. 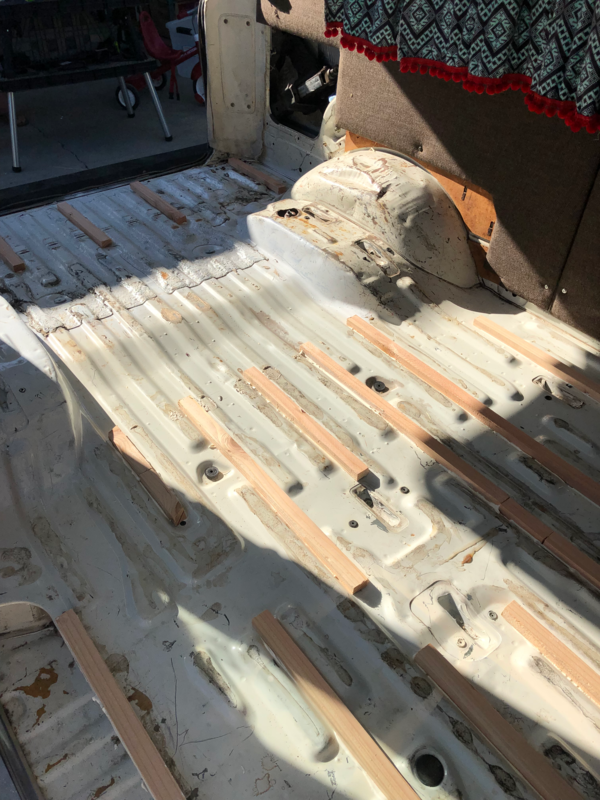 Since there were slats that ran down the van we needed to install some planks in between. This way we could lay a piece of plywood on top and lay it in. This also helped us not put screws into metal. Anytime I’m cutting or putting screws into metal it makes me nervous. Not to say that it can’t be done but sometimes I just don’t want to do it if I don’t have to. We installed the slats by using construction grade adhesive. Don’t be shy! Smother that stuff on there like you would pour syrup on a waffle. This stuff takes some time to dry and become strong. 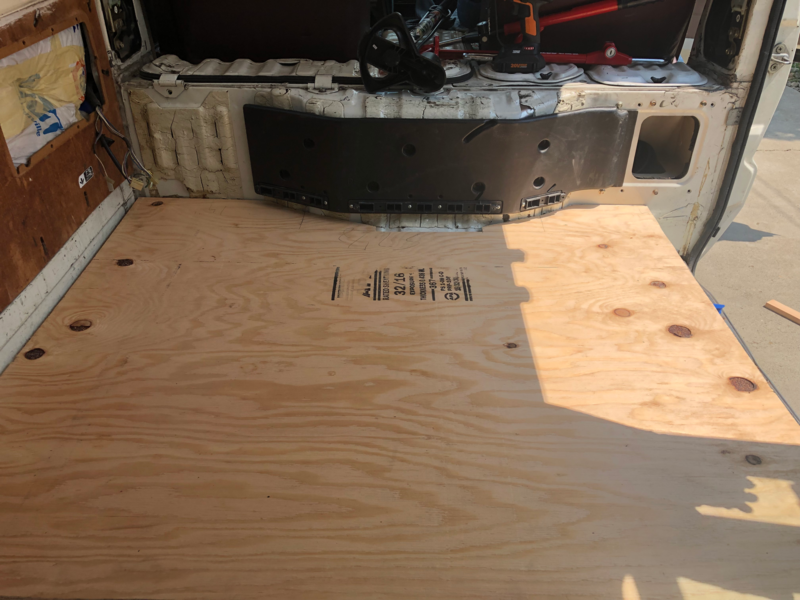 I think we waited 24 hours before trying to install the piece of plywood. We pre-tapped the holes and my brother had this handy drill that would flip from drill to screwdriver. It had the ability to set a countersink which made the screws fit flush. Real nice! 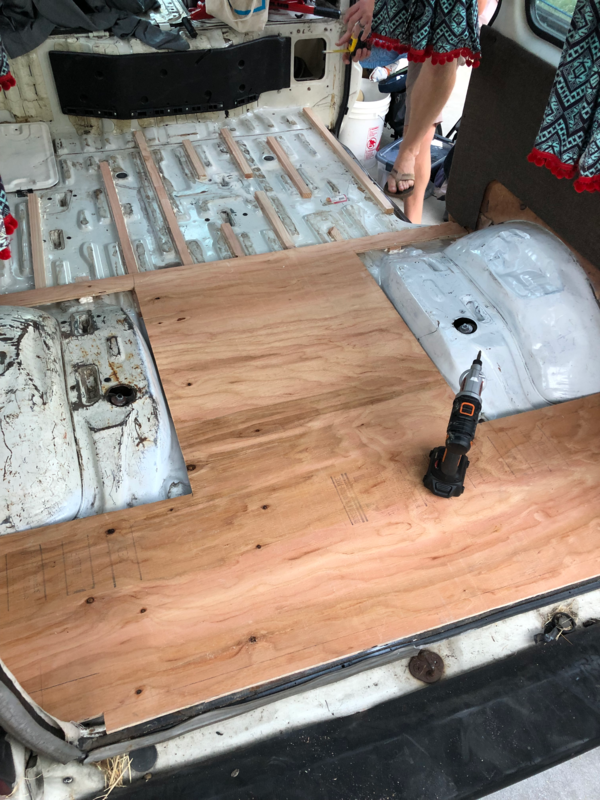 We had to do the floor in two separate pieces because of the size plywood comes in. My brother is the measure so I followed his lead and we cut each piece one at a time. There are all sorts of weird bends and things to cut around so I was really impressed when our pieces came out and fit so well. Here’s a pic of both plywood pieces installed. 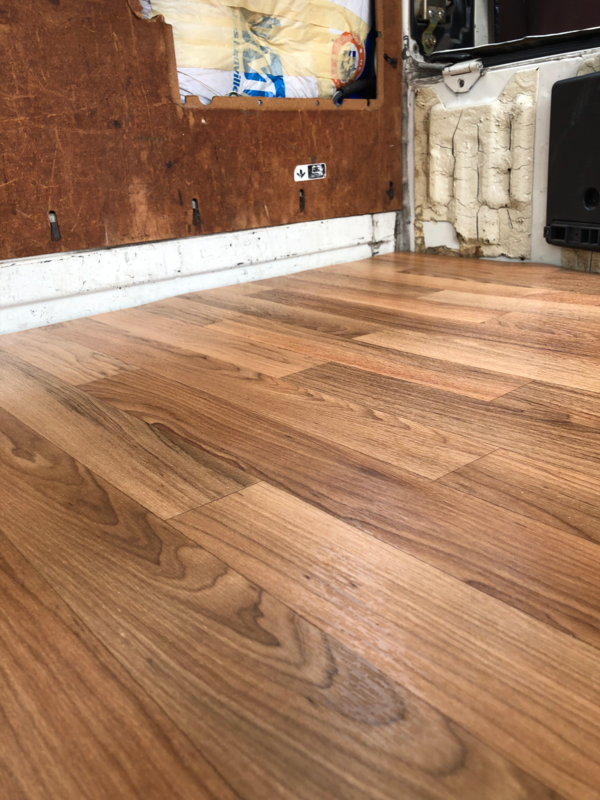 Next, it was time to lay the vinyl floor that looks like fake wood. Yeah, it’s a little overplayed but so what, I think it will look classy with the white bench. Maybe not but you only live one life. 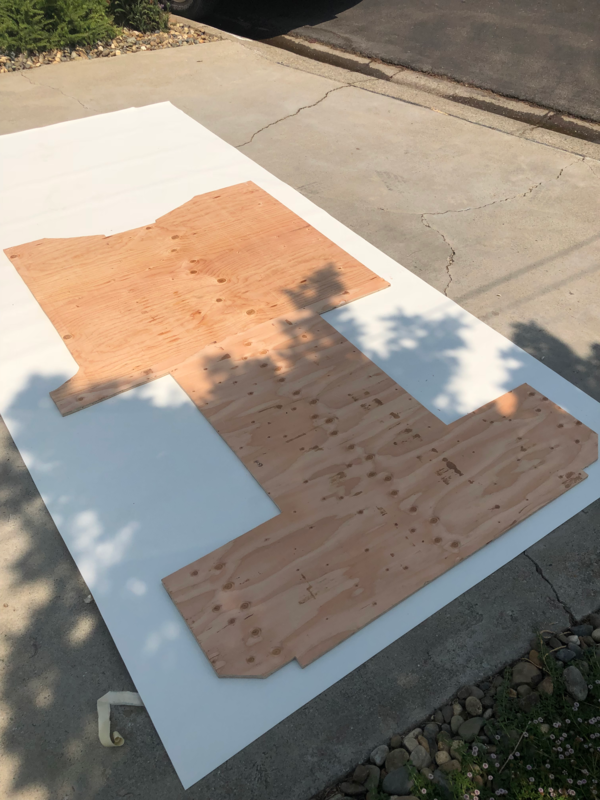 We needed to cut it before applying it to the ply wood so before we installed the plywood pieces, we created an outline on the vinyl. After it was cut, it was time to apply. The guy at Home Depot, yeah, that’s right, I found someone who would actually help me there. He said that this double sided tape would work just fine when attaching vinyl to wood. So, that’s what we went with. I bet the floor would have had less bubbles if we used a puddy but overall, it was really easy to apply and it sticks very well.